Did I finish my homework, gulp down my supper, and get out of the house fast that evening. I am not sure of the exact date, but it was a cold, wet night, and I ran as fast as I could from Glan-y-Pwll along St. David’s Road down towards Nefyn. I guess I was about fifteen years old, so it was probably late autumn 1956. The focus of my rushing was to meet my friends Arthur Ensor (deceased Nefyn July 1998) and Twm Jones (Thompson - deceased Scotland May 2010), and to get into the Nefyn Constitutional Club as early as possible. Fred Davis, the World Snooker Champion, was in town giving a snooker exhibition at the Club that evening, and we were eager to see him in action. Nefyn had two established Men’s Clubs at the time – the Nefyn Constitutional Club, located in a building directly across from the Nanhoron Arms Hotel (it is still located in the same place); and the Nefyn Liberal Club, located on a floor above a greengrocer shop and women’s hairstylist shop in the Anchoria Building on High Street, two doors from the Sportsmen Hotel. Both clubs were political in origin, tied respectively to the Conservative and the Liberal Parties. The Constitutional Club had two rooms - one large room with two snooker tables, and a smaller room for darts and card playing. The large room was customized as a snooker room, with appropriate recesses in the walls to avoid any wall-to-cue interference when you were playing snooker. The Club also owned the attached house, where club caretaker Robin Williams and his family lived. The Liberal Club on the other hand was a much smaller entity comprising of only one room with a single snooker table. There was no bar in the clubs, and no alcohol was allowed on either premises. In Welsh, the Constitutional Club was referred to as ‘Room Uchaf’ located on the top of Tower Hill, and the Liberal Club as ‘Room Isaf’ located at the bottom of Tower Hill. With no other organized social activities available, most teenage boys in Nefyn pivoted towards becoming members in these clubs. If you became proficient enough as a snooker player, you could play on the clubs two divisional teams, competing with similar local clubs in Pwllheli, Chwilog, Abersoch etc. – a more pleasant way to while away those long and dreary winter months. Parents in general were not in favor of boys getting involved in such activities. Pressure was also applied by the occasional teacher at Pwllheli Grammar School, saying that the activity was not condoned, and that “snooker truly was a sign of a misspent youth”. I remember art teacher Elis Gwyn Jones at Pwllheli Grammar humorously reprimanding Arthur Ensor for drawing a snooker player as his favorite sport. “Snooker a sport!! !” Ellis Gwyn retorted in Welsh “Panu pel rownd bwrdd efo prick!!! (Slapping a ball around a table with a stick!!!)”. But the boys were not so easily deterred, and they were all eager to join. Strictly you had to be eighteen years old before you could sign on, but thankfully the rule was not rigidly enforced. And provided you behaved yourself, becoming a member was not a problem. Arthur, Thompson, myself and several other teenagers did join, and we all played on those various snooker teams while living in Nefyn. In hindsight, it was quite a good youthful competitive activity. It was little bit of a plus when I came to live in the United States. Here, we play a similar game called pool, but played on a smaller table with much wider and easier pockets. I was surprisingly regarded as a decent pool player in America as a result of my early Nefyn snooker experience. The room was already full of men when the three of us got into the club. We squeezed into a standing position in a corner for a decent view. One snooker table, the one not in use for the exhibition, had been covered with a cloth so as to focus all the attention on the second table, which had been meticulously cleaned, polished, and ironed earlier in the day by Robin and his elderly father-in-law Evan Jones. It was very warm in the room, and cigarette smoke floated in a bluish heavy haze over the snooker table with its canopy-style power lighting. Everyone was excited about the exhibition. Fred Davis was very popular all over the country, and this was in the days before snooker became a national British pastime. Just seeing the guy was enough of a kick for us youngsters, never mind seeing him demonstrating his snooker potting (pocketing) abilities. He was staying across the road in the Nanhoron Arms Hotel, and was due to appear at eight o’clock. Around seven thirty, one of the Club’s ruling members, announced he had received a note from Fred Davis indicating that, as was tradition in these exhibitions, he would be challenging the best snooker player in the Club to a three frame game. Without hesitation everyone in the club turned to Thomas Edwin Owen (Twm Ed as he was more popularly called) to take on the challenge. It was an immediate shock for poor Thomas Edwin who was standing nearby, and although he seemed initially overwhelmed with the prospect of playing snooker against Fred Davis, he soon regained his composure and willingly accepted the challenge. A little diversion here for a minute, but Thomas Edwin was without question one of the two best snooker players in the whole region. He was captain of the first division team in the Constitutional Club, a team that included other stalwarts like Gwilym Rhianfa, Now Hughes, Dafydd Wyn, Ned Mynydd, John Humphreys, and others, but Thomas Edwin without doubt was the premier player. He was also a very nice, pleasant, and well-liked individual. He was a single man in his early thirties, who lived with his parents in Tan-y-Groes, a house located on the square in Nefyn. His father, John Richard Owen, was a well-known local photographer, who introduced photography to Nefyn in the early 1900’s. Thomas Edwin told me years later that his father got interested in photography after he acquired from an elderly gentleman a glass negative taken in the 1870’s showing sailing ships in the process of being built on Nefyn beach. 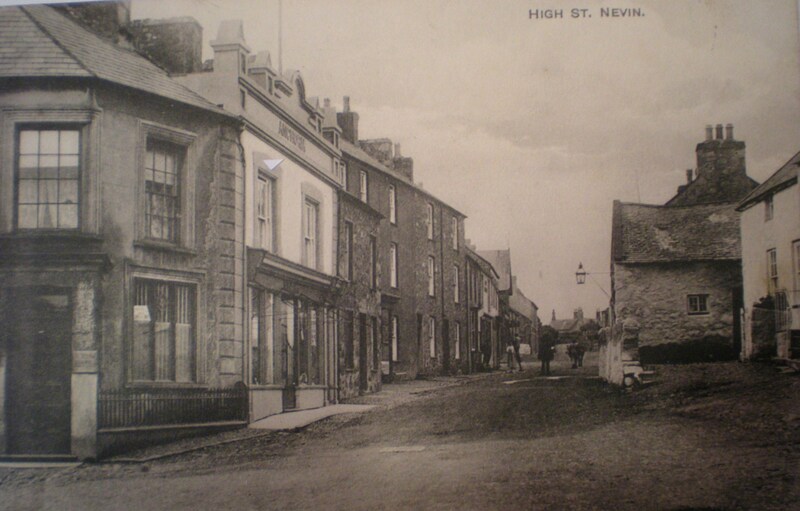 His father thought the glass negative was of historical significance to Nefyn, and being an entrepreneur decided it would be good business to sell copies of that photograph in postcard form. Postcards were an exploding new business in the early 1900’s. People were starting to venture on holidays all over the country, and a scenic postcard was an easy and inexpensive way to let their families back home know where they were enjoying themselves. His father soon acquired a folding box type camera on a tripod with a black cloak, and quickly learned how to take shots and process postcard photographs in volume. He then set himself up in business selling those scenic postcard photos in local shops. 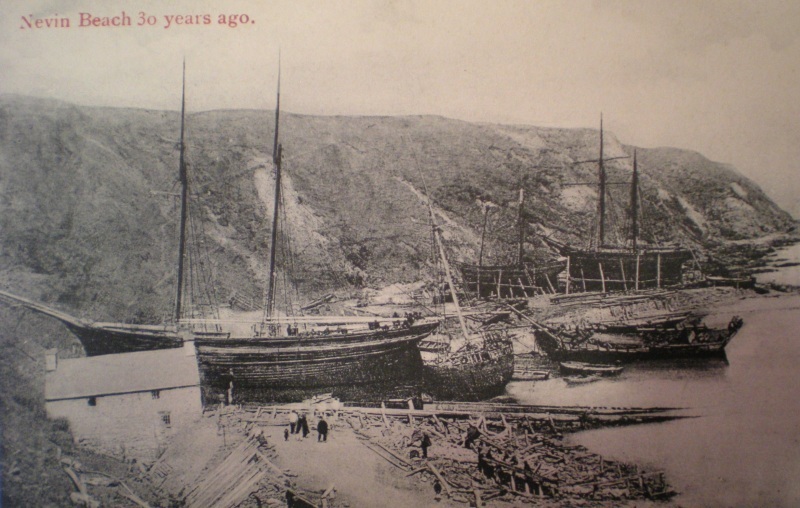 J R Owen signed photographs of Nefyn are often available on sale on E-bay, and a copy of his 1870 Nefyn beach sailing ship postcard is included in this story. The photo has adorned the cover of a couple of books, and has become without doubt the premier early photograph of Nefyn in its sailing ship heydays. Returning to the diversion, Thomas Edwin had a very bad accident when he was a teenager that seriously affected his mobility. He fell from a tree through the roof of his father’s glasshouse in the back garden, and pieces of glass became embedded in his leg. He did not tell his parents right away about the seriousness of the leg injury, and as a result the leg became badly infected. It was nearly amputated. The corrective surgery to save the leg left him with a severe disability, a very pronounced and permanent limp. 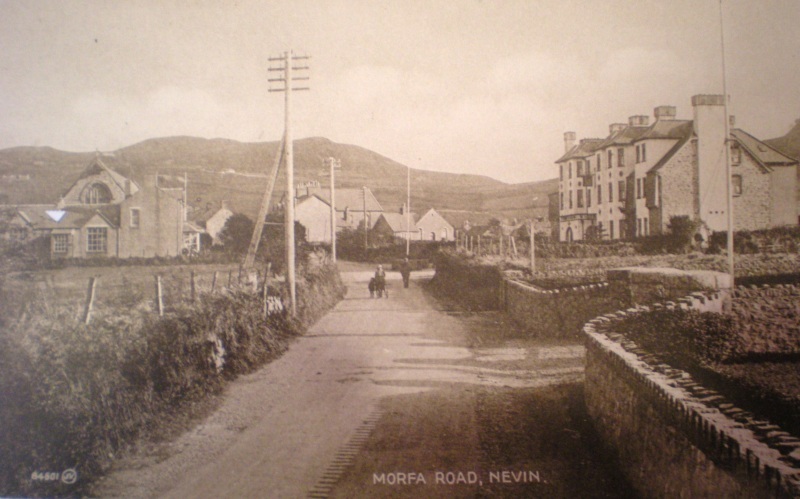 Returning to the story, Fred Davis finally arrived from the Nanhoron Arms Hotel across the road. He worked himself into the very crowded room, and standing by the lit snooker table proceeded to introduce himself to the crowd. He cracked jokes about his older brother Joe Davis, who was also a very famous billiards player, and then proceeded to mesmerize the crowd with a series of demonstrations, trick shots, and potting (pocketing) skills on the snooker table. He did this for approximately an hour or so, and it was extremely good entertainment for us youngsters. He then followed with a sales pitch for billiard cues, signed by him, which he had for sale. He had a few takers. He then took a short break, while a member of the club held a raffle drawing, also on a billiard cue, with the proceeds to benefit the club. Fred Davis returned, had the table set up for a snooker game, and then very nicely asked for a club representative to come forward and play 3 frames. Thomas Edwin limped forward to get his personal cue from where it was stored in a hanging case in the corner near where we were standing. They shook hands, and tossed a coin to see who would open the game. Fred Davis won the toss and he asked Thomas Edwin to open. Thomas Edwin did, and Fred returned to the table to make a brilliantly executed break of approximately eighty points finishing that first frame in his favor. He was certainly a very skillful player, and there was an appreciative round of applause. They then set the table up for the second frame, with Fred opening this time around. There followed a short spate of scores from both men with strong safety plays, and then Fred suddenly broke the red balls wide open. That was a mistake, since he was not aware at that point of his opponent’s capabilities. Thomas Edwin limped around the table, and made an astonishing break of ninety plus points which ended with him potting the pink ball into the center pocket and terminating that second frame in his favor!! During the break itself you could have heard a pin drop in the room, but when that pink ball fell into the pocket the whole place exploded!! Pandemonium broke out!! Thomas Edwin had defeated the World Snooker Champion!! No one expected this to happen!! It was unheard of!!! My God, a Nefyn man had defeated Fred Davis in a snooker game!! It took nearly half an hour for the room to regain its composure so they could continue the exhibition. Fred Davis was now aware of his opponent’s capabilities, and played a much more conservative game narrowly winning the last frame. That saved him a little face, I guess. He was a very good sportsman though, and took it all in stride. He heartily congratulated Thomas Edwin, and then left the Club to a huge round of applause. But the damage was done. Thomas Edwin had won that one game against the World snooker champion!! What an exciting evening for us youngsters!! We scooted out of there shortly after since we had to be in school in Pwllheli early the following morning. But what a snooker game though!! It was a snooker game that was talked about for many many years afterwards in the Constitutional Club in Nefyn.